Cosmpiercers, in Starmourn MUD, are ancient, extremely powerful sensor stations built by the now-extinct Ta-deth, an Elder Race. They still function to this day, and the major player civilizations (Scatterhome, the Song Dominion, the Celestine Ascendancy) fight for control over them, as well as for ransom that the Y'saari - another Elder Race - pay for their use. 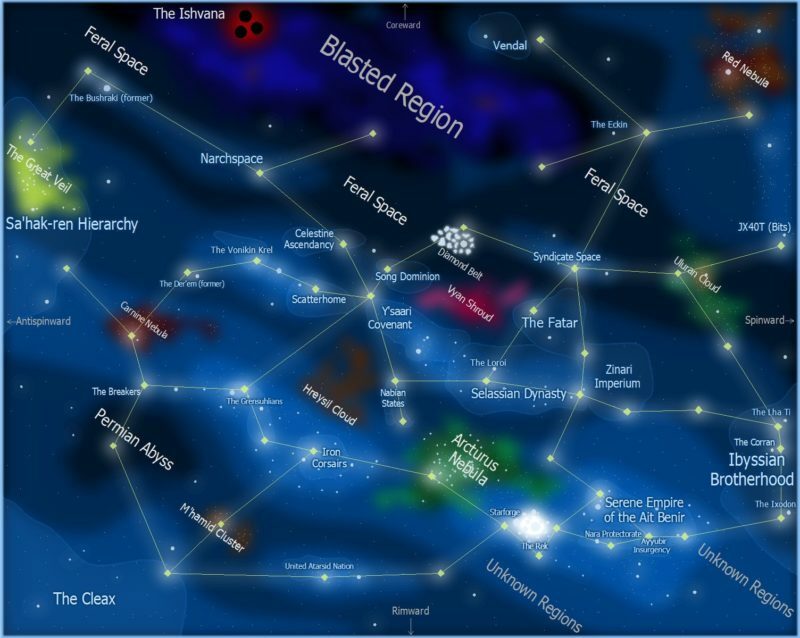 Each space zone in Starmourn (a 250 x 250 area) might have a Cosmpiercer, though never more than one per zone, and all zones do not possess them. When your civilization controls a Cosmpiercer, any member of your civilization may use it, while in that zone, to survey the zone, showing you the coordinates and rough direction from you of every entity in that zone, including ships, planets, stars, interstellar clouds, asteroids, and so on. Further, when your civilization controls a Cosmpiercer, the Y'saari will pay both the civilization and those individuals who captured the Cosmpiercer, every in-game month. Capturing a Cosmpiercer is a matter of taking simultaneous control of the control rooms on the space station its housed in. There's never less than two control rooms, and there may be as many as four on the more difficult ones. Players must fight off any space defenses around the station, board the station, then fight their way to the control rooms, where simultaneous commands must be executed to take control of the station. So, at least two people are always required to take a Cosmpiercer. Once you've captured one for your civilization, it will automatically populate with soldiers and sentries from your civilization, and both you and your civilization will start receiving payments monthly from the Y'saari, for as long as they remain captured by you. The harder the Cosmpiercer is to take, the more the Y'saari will pay. Further, there are bonuses to how much the Y'saari will pay based on how many Cosmpiercers your civilization controls in contiguous zones (meaning zones that are connected n/s/e/w to each other). Connect 20+ controlled Cosmpiercers and the Y'saari will pay your civilization, and the players who captured that station, up to an extra 30%+ per Cosmpiercer. There's also an easy way for all players to look at a map of zones and see which civilization controls the Cosmpiercer (if there is one) in that zone.